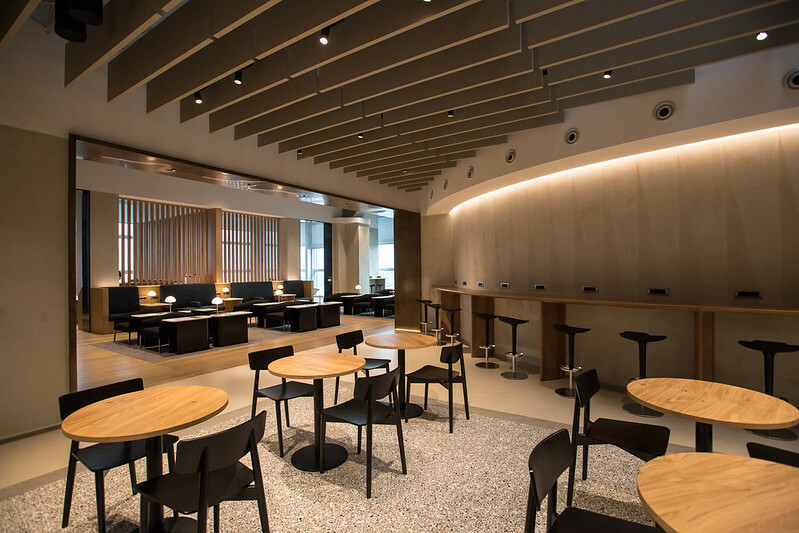 British Airways has opened a new lounge at Rome Fiumicino airport, following a new design concept which the carrier says features “the very best of British and European design and delivering a luxurious and contemporary look and feel”. The 460sqm lounge can accommodate up to around 140 guests, and features a centre-piece granite-topped bar, which is hosted by a mixologist during peak times, and allows for self service use during quieter periods. Other facilities include wireless printing, power and USB charging points, marble tables, and artwork from the carrier’s collection including pieces from Patrick Caulfields’s 1973 series “Some Poems of Jules Laforgue”. The lounge’s windows also have smart electronic blinds, which “are programmed with sensors to react to light and heat throughout the day, ensuring that the lounge is always a comfortable environment for customers to relax in”. The new Rome lounge is located within Terminal 3 at Rome Fiumicino, and according to the Oneworld website is open daily from 0515 to 2030. The new facility is part of an investment in BA’s lounges, with a new look space at New York’s JFK Terminal 7 the next to be unveiled, followed by a new lounge at Aberdeen later this year, and further planned investment at Geneva, San Francisco, Johannesburg and Chicago airports. Earlier this year BA added new lounge access partnerships at Ibiza, Innsbruck and Seville airports.